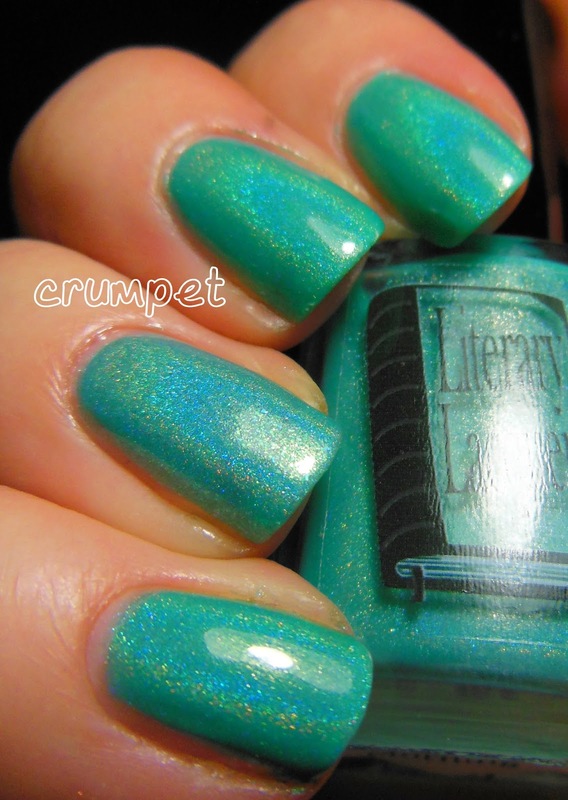 You may know I have a thing for turquoise polishes, and I also have a thing for Literary Lacquers. In fact, Literary Lacquers Pan Galactic Gargle Blaster is probably my favourite turquoise of all time, but now ANOTHER turquoise joins the mix. This is Some Glad Morning, a limited edition, and it's beautiful. It's milder, mellower than PGGB, but equally beautiful. With this polish, there is nothing to interrupt the holo, and this baby coos gently and beautifully, softly gracing your fingertips. She's not *quite* as green as my camera wants her to be, but she is more sea-greeny than PGGB. On the accent nail (ring finger) I have ANOTHER LL turqouise, the recently released Ether Binge. The contrast shows the beautiful silver lacing in Ether Binge, although tonally they are similar. Can you justify both? Of course, they're glorious! Ha ha. Check back later for some seriously awesome nail art with this pair.